Puerto Rican music is the most well-known Caribbean sound heard throughout the United States. 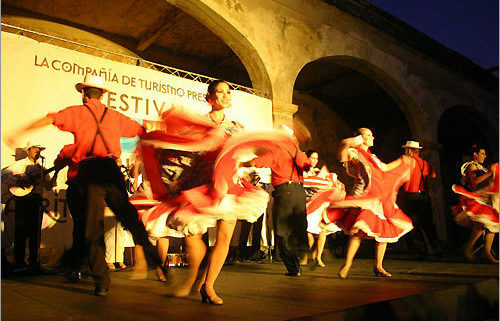 Many people associate the unique beats and rhythms as part of the passionate Latin American dance numbers commonly seen in dance competitions and many dance clubs throughout America. Puerto Rican music is always a sure way to get you tapping your feet and moving your hips. The music of Puerto Rico is closely associated with the African and Spanish traditions that inspired it. Four known Puerto Rican instruments were adapted from the Spanish six string guitar; the cuatro, the requinto, the bordonu, and the triple. They all produce their own unique pitch and sound. The cuatro is the most popular of these instruments and is revered as the national instrument of Puerto Rico. It is typically carved from solid blocks of laurel wood and is known for creating pitches that are different from the typical Spanish sounds. The island is also known for its prevalence of percussion instruments. Tambours (hollowed tree trunks covered with stretched-out animal skin) and maracas (gourds filled with pebbles or dried beans and mounted on handles) are some of the most common percussion instruments heard in Puerto Rico and are known throughout the world. These are some of the variety of drums that were brought to Puerto Rico by African slaves. They widely contribute to the island’s unique folk music sound and really integrate the sounds of both Spanish and African music. 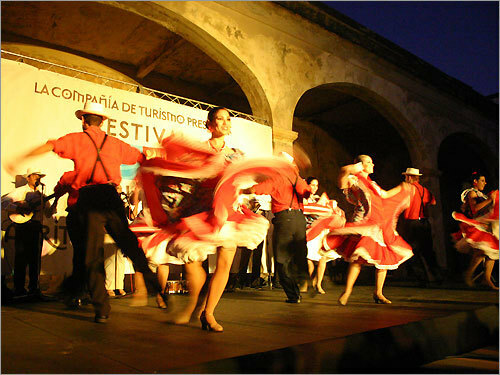 The most well-known dance that Puerto Rican’s have shared with the world is the salsa. Known as the rhythm of the islands, the name salsa literally means “the sauce that makes parties happen.” Unbeknownst to many, the salsa actually originates from the Puerto Rican community in New York. It draws inspiration from the musical roots of the Cuban and the African Caribbean experience. Salsa has made Puerto Rican’s internationally famous in the music scene. The music for salsa requires a wide variety of percussion instruments that include the güiros, maracas, bongos, timbales, conga drums, and claves, and to add the jíbaro (hillbilly) touch, a clanging cow bell. Traditionally, it also takes a bass, a horn section, a chorus and, a lead vocalist to get the combination right. Even though the Puerto Rican music can be experienced in many places around the world, any traveler who has the opportunity to hear the unique sounds of the best music in the Caribbean in its original environment is in for a truly special experience.